An experience that combines some of the loveliest destinations in the Mediterranean with a series of private recitals by classical musicians: that is what we offer on this voyage from Athens to Rome. 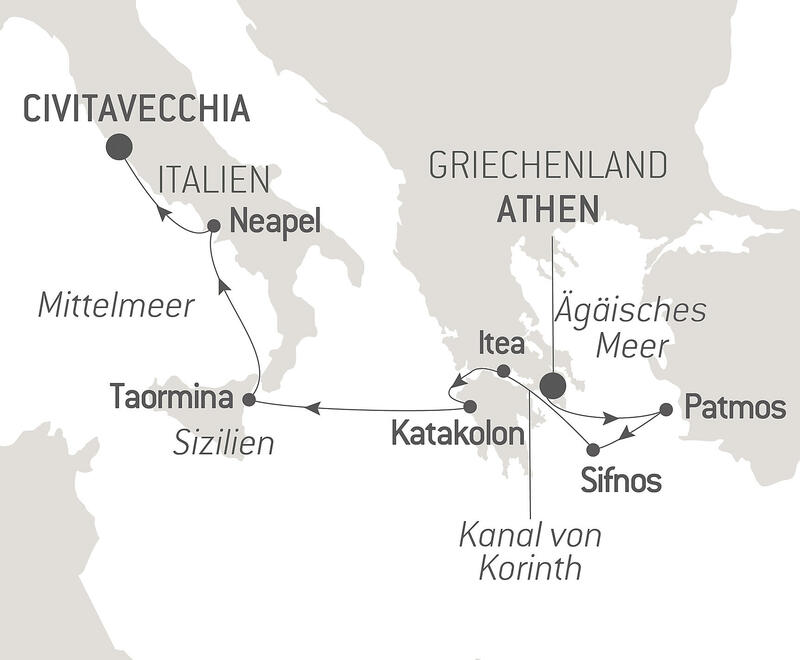 From Classical Greece to Imperial Rome, we have the opportunity to discover important sites everywhere along our way - sacred Patmos, where John the Evangelist recorded his visions of the apocalypse; the Apollo's Oracle at Delphi, where men came to learn their fate; Olympia's Sanctuary of Zeus, home to the Panhellenic Games; the Greek theater in Taormina overlooking Mount Etna; Pompeii, the Roman resort and spa both destroyed and preserved by the eruption of Vesuvius in 79 A.D.
To witness these iconic sites is in itself an extraordinary experience. To do so in the company of world-class performing artists is an irresistible proposition. The artists - violinist Kristin Lee, cellist Nicholas Canellakis, pianist Michael Brown, and flutist Jasmine Choi - were personally invited by the artistic director of this special voyage, Michael Parloff, who chose these four not just for their superb talent, but also for their affable personalities. As the first ship in a new series that remains true to the Ponant spirit, Le Bougainville will embody the unique atmosphere that is the cruise line’s hallmark: a subtle blend of refinement, intimacy and comfort.